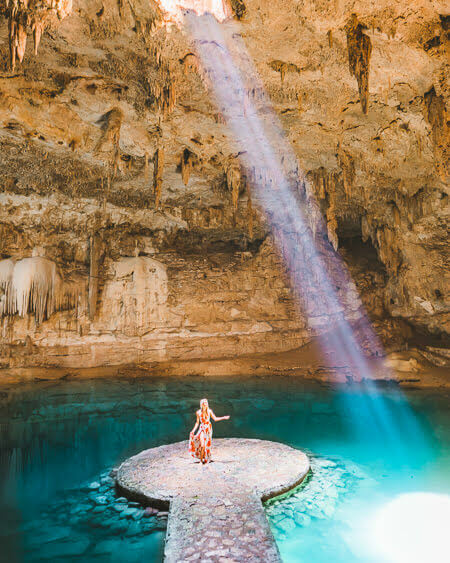 Mexico’s lush jungle is home to some of the best treasures in the world like the mysterious and alluring underground sinkholes called cenotes. 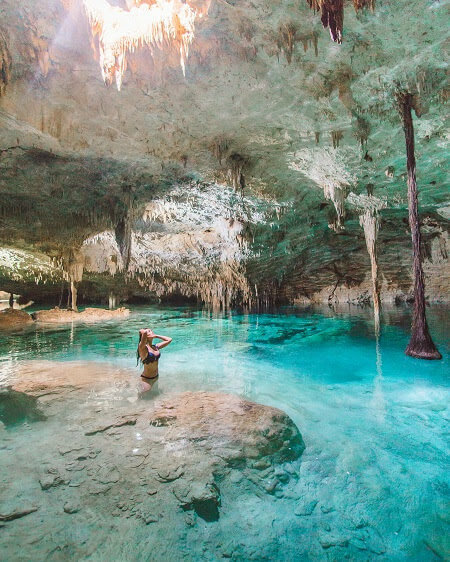 From caves filled with low hanging stalactites to shallow ponds with crystal clear water, cenotes are unique to Mexico’s Yucatan peninsula and a must visit for anyone traveling to Mexico. 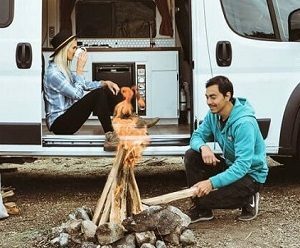 This year we spent 6 months driving through all of Mexico in search of unique adventures and attractions. (Psss, if you want to know our top 10, check out our post on Mexico’s top attractions here). Once we finally arrived in Yucatan peninsula, visiting cenotes was by far my favorite part of this area. But Yucatan and Quintana Roo regions have over 6000 cenotes so it can be tough to choose which ones to visit on a short vacation. 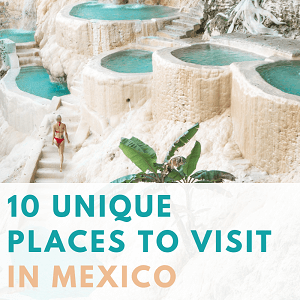 If you are planning a visit to Cancun or Tulum, we have compiled a list of 10 unreal cenotes in Mexico by different regions and attractions that make them popular. If you want to learn more about best beginner photography gear, check out our super-informative camera gear article here. If you’re vacationing in Tulum, the Gran Cenote (also known as the Great Cenote) is the best cenote to visit in this area. Known for its beautiful jungle backdrop and crystal clear blue water, the Gran Cenote is not only picturesque but also a great place to go swimming and snorkeling. The highlights of this cenote include two swimming areas connected by a cave. Visitors can snorkel between underground stalactites, free dive in the cenote cave system and check out the mini turtle sanctuary set up inside the cenote. The Gran Cenote is super clean, well-kept and includes amenities like showers and nice restrooms that make it a highly popular destination for Tulum’s visitors. The entrance cost to the Gran cenote is 180 pesos per person (equivalent to $9 USD) and includes access to the cenote and its amenities. 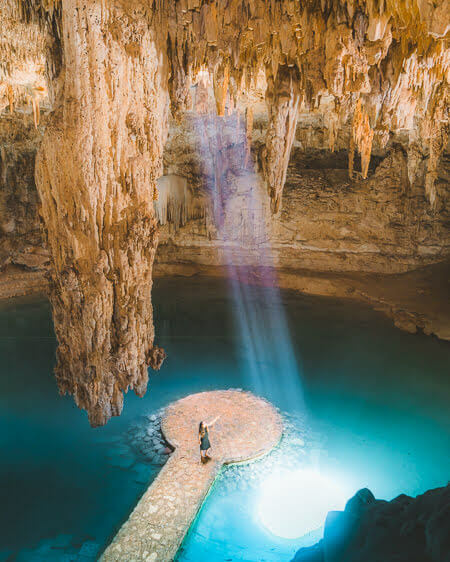 To get awesome pictures at the Gran Cenote, make sure to get there early to beat the crowds. The best backdrop for photos is at the second swimming area, down the walkway from the main entrance. To capture photos at the Grand Cenote we used our Sony travel camera with this polarizer filter to remove glare from the water and to enhance colors. The incredible Suytun Cenote is one of the best cenotes to visit on a day trip from Cancun. With a perfect round underground cave and a walkway situated right in the middle of it, the Suytun cenote is both mystical and picturesque. During the summer season, a light beam shines right unto the walkway creating a sacrificial-like setting. 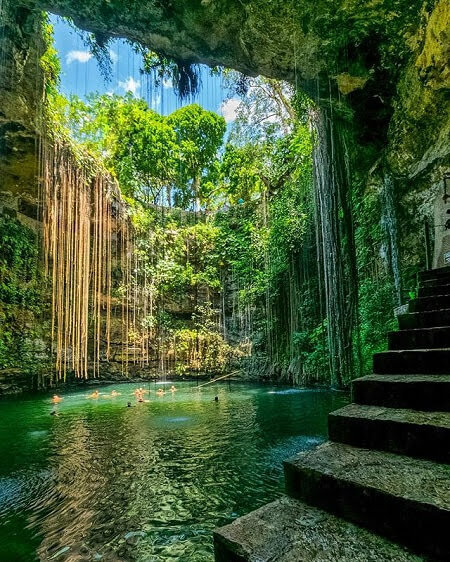 In fact, many of Yucatan’s cenotes used to be sacred grounds for Mayan rituals and the Suytun cenote offers a little glimpse into that ancient civilization. It’s easy to spend a few hours at the Suytun cenote Ooo-ing and Aaaa-ing at its incredible settings. And luckily the Suytun cenote is not only photogenic but also cheap to visit at only 70 pesos per person ($3.50 USD). As one of the most popular cenotes to visit from Cancun, be ready for this cenote to get crowded. The tour buses start getting there as soon as it opens at 9 am but if you stick around long enough, you will get time slots without anyone else there. The cenote is completely underground so you’ll need a tripod to stabilize your camera to compensate for the dark setting. We used this tripod along with this Rokinon lens to get a wider shot of the cenote. Calavera cenote (also known as the Temple Of Doom) is one of the best cenotes in Mexico for cave scuba diving. Experienced tour companies like Koox Diving Company In Tulum offer guided diving tours to the Calavera Cenote. Beyond diving, this cenote is also popular for jumping and swimming in its underground cave rivers. The Temple Of Doom cenote looks as cool as it sounds. With multiple openings that peek down into the mesmerizing starling blue waters underground, it takes no time before you’ll be lured in for a jump. The Calavera cenote has three entrances to get underground. The main wide entrance has a stair leading down that can be used to climb in and out of the cenote. But by far the most daring (and fun) way to get into the cenote is by jumping through one of the smaller openings in the ground. Although the first time jumping through this smaller cenote it feels a bit intimidating, it’s one of the best adventures we’ve had in the Quintana Roo region. The entrance cost to Calavera Cenote is 100 pesos per person ($5 USD) to go swimming or 200 pesos ($10 USD) to go diving. To capture videos and underwater shots at the Calavera Cenote you’ll need a waterproof camera like this GoPro along with a waterproof handle to hold on to it while you jump or dive in the cenote. If you’re looking for an awesome cenote to go snorkeling, put the Tak Be Ha cenote on the top of your list! We stumbled upon this cenote by talking to the locals and it quickly became one of our favorites of the trip. Hidden in the Tulum jungle, the Tak Be Ha cenote is not well known which makes it even more amazing. We spent the entire afternoon snorkeling and swimming in its deep blue cave waters and enjoying the quiet crowd-less atmosphere. The entrance cost to the Tak Be Ha cenote is 200 pesos ($10 USD) and comes with access to swim, snorkel or scuba dive in the cenote. It can be very difficult capturing the essence of a cenote in one shot so I use a Rokinon wide angle lens to get the most of the scenery into one frame. This Rokinon lens is also great for dark settings. This lens comes with a low aperture of F2 that can light up a dark scene without adding too much grain. Yaxbacaltun is one of the best cenotes in Yucatan peninsula for swimming and cooling off from the hot Mexico weather. The Yaxbacaltun cenote has wide stairs that lead down into a large cave made for swimming. 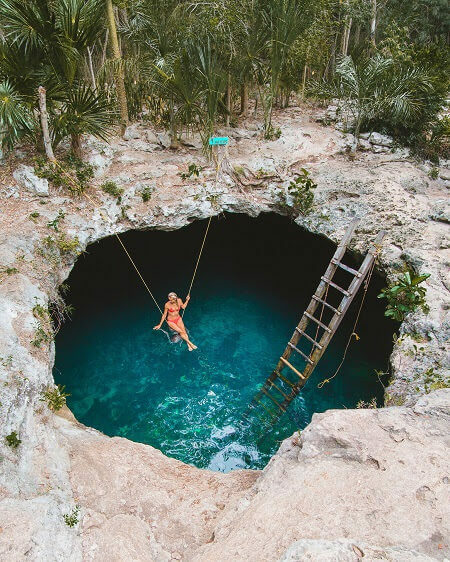 The best feature of the Yaxbacaltun cenote is a long swing that will launch you from one edge of the cenote all the way across it deep into the water. After spending 6 months driving through all of Mexico we were in much need of a relaxing spot to reboot and the Yaxbacaltun cenote was the perfect place to do that. 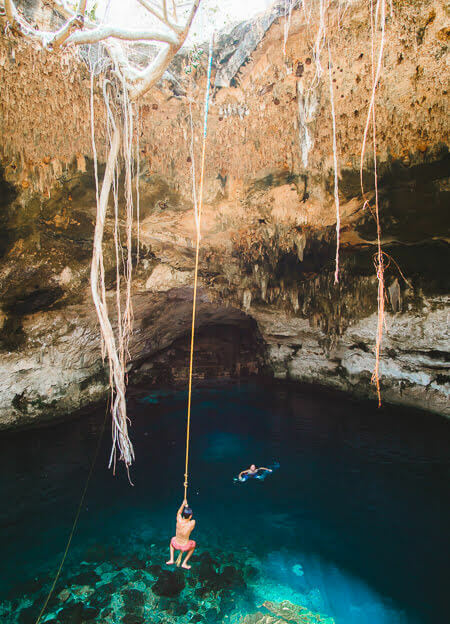 We spent the entire day swinging, jumping and swimming in this cenote. And for 30 peso entrance fee ($1.50 USD) the Yaxbacaltun cenote is one of the cheapest cenotes in the Yucatan area. To get an active moving shot make sure to set the shutter speed to at least 200 or more so the image doesn’t come out blurry. We also shot these images in Continuous Shooting mode which takes a quick burst of multiple images so you don’t miss a beat. Valladolid is a cute colonial town in Yucatan rich in history and filled with charming colonial streets. It is also home to a few amazing cenotes including the Zaci cenote. 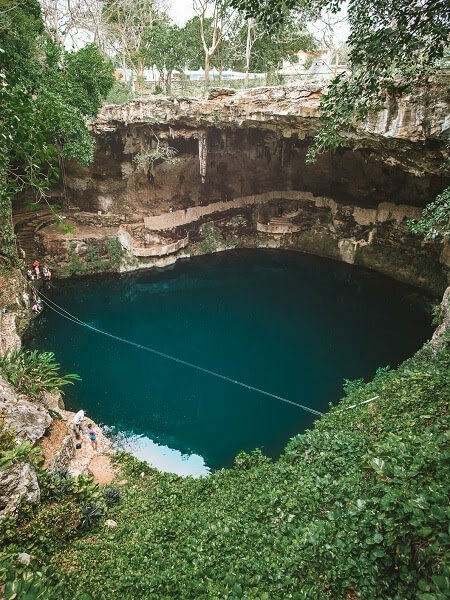 If you find yourself visiting and roaming around Valladolid, make sure to stop by the Zaci cenote. 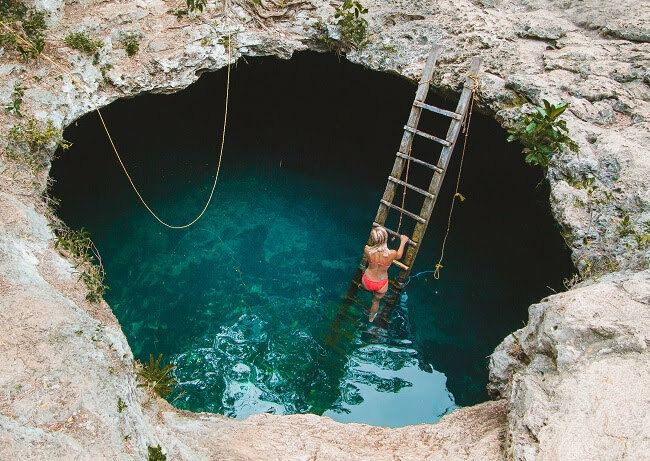 While most cenotes are typically found on the outskirts of the cities, the Zaci cenote is built and accessible right in the midst of Valladolid’s busy downtown. For 30 pesos ($1.50USD) visitors can walk around the Zaci cenote and enjoy its lush green park-like setting before trying out local Mayan food at one of the amazing restaurants in Valladolid. If you want to capture a shot of the entire cenote we recommend using a wide lens like this Rokinon one. We use this Rokinon wide lens on most of our nature shots along with our Sony camera to capture the entire scenery and to avoid bad angles or crops. Most people visiting the historical Chitzen Itza pyramids also make a stop at the stunning Ik Kil cenote within a short 10-minute drive from the pyramids. The Ik Kil cenote backdrop is beautiful with a wide opening into the sky, a stairwell leading down to it and lush jungle vines winding all around it. 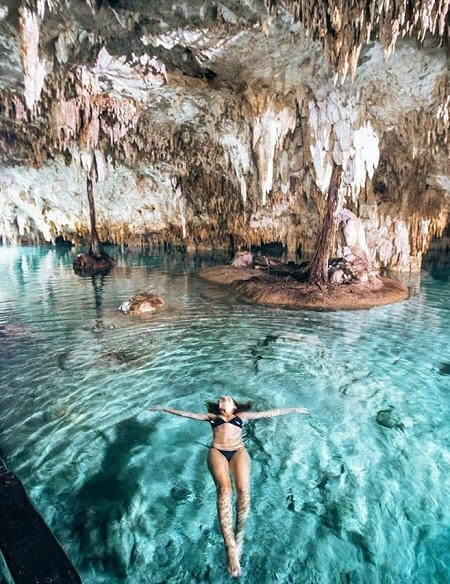 After spending a few hours roaming around the pyramids in the hot Mexico heat, the Ik Kil Cenote is the perfect place to cool off in its refreshing deep blue water. The entrance fee to visit the Ik Kil cenote is 80 pesos per person ($4 USD). As one of the most popular cenotes near Chitzen Itza, the Ik Kil cenote gets packed with crowds and tour buses during the day. Make sure to go super early if you want to beat the crowds to get good images. While Mexico’s Yucatan peninsula has over 6000 cenotes, each is very different and unique in its looks and formations. Chihuan cenote is located completely underground in a cave filled with deep blue water and low hanging ceiling. The only light sources in the Chihuan cenote are the lights set up by its owners allowing enough light to see underground yet still exuberating an eerie feeling. Ropes are also set up along the cenote to assist and maneuver swimmers to explore different parts of this cenote. The entrance cost to the Chihuan cenote is only 60 pesos per person ($3 USD) to visit and swim in this underground cave cenote. Because this cenote is completely underground and has no natural light coming in, it’s helpful to have a low aperture lens like this Rokinon one to compensate for lack of light. 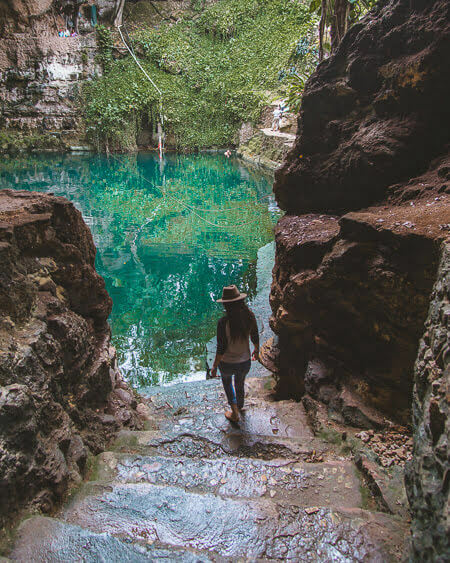 If you’re looking to visit a cenote off the beaten path, the Miguel Colorado cenote is one of the coolest cenotes to visit hidden in the Mexico jungle. Shaped like a round pond, this cenote is popular for its abundant wildlife and eco-tourism activities that it offers. At the Miguel Colorado cenote visitors can rent kayaks, zip line above the cenote or hike the trails around it. The cost to spend a day at the Miguel Colorado cenote is 80 pesos per person ($4 USD). 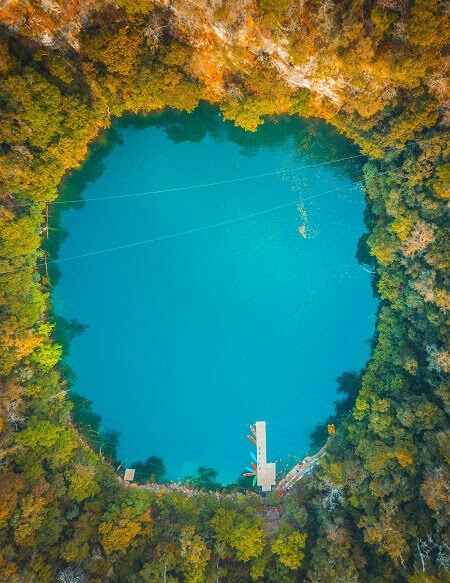 To capture the full beauty of the Miguel Colorado cenote from the air we used our DJI Mavic drone. The best times for droning are mornings just after sunrise and evenings before sunset. This is the best time for photography lighting and as a bonus, you can count on the cenote being empty as well. If you’re looking for the one cenote that has it all, the Sac Actun cenote is the top cenote to visit in all of Mexico. With the largest underground cave system, the Sac Actun cenote is perfect for swimming and snorkeling. Tours are available at this cenote that include both at a price of 450 pesos ($22.50 USD) per person. At the Sac Actun cenote, expert guides will take you through numerous underground caves and tell you more about the Mayan history. 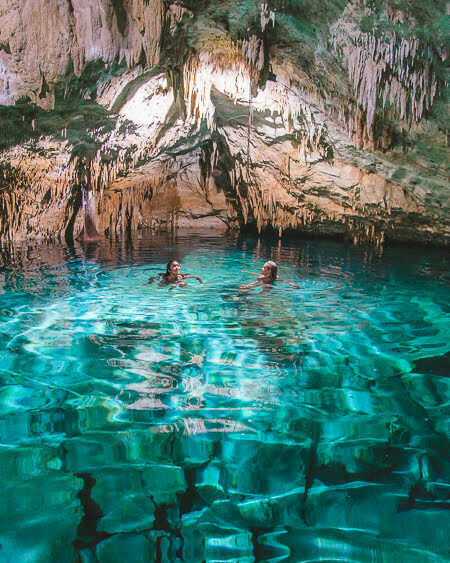 On your visit, you’ll get to see a part of the largest cave system in Yucatan peninsula, see underground stalactite formations and enjoy a nice snorkeling experience in the water. The price to visit the Sac Actun cenote is a bit steeper than other cenotes in the area but includes guides and snorkeling rental. Just about anyone that visits this cenote claims, it was their favorite cenote in all of Mexico. 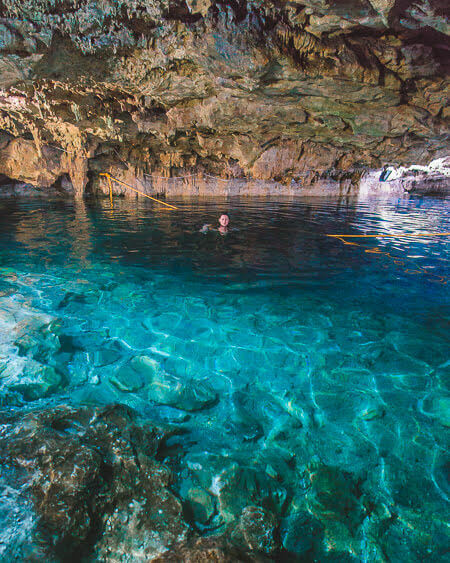 The Sac Actun cenote is super popular so make sure to arrive early to avoid crowded tours. While touring the Sac Actun cenote you’ll be spending most of your time in and around water so you’ll want to bring a waterproof camera or a GoPro like this one to capture images underground. Can’t get enough of Mexico inspiration? Check out our post on top places to visit in La Huasteca Potosina! 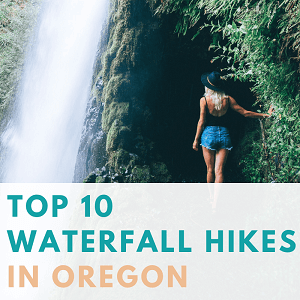 If you enjoy visiting turquoise blue waterfalls and incredible jungle hikes (and who doesn’t?! ), then you’ll love this post!